Tracking dog handler listing at the UBT website. Promotional materials and support for those seeking legalization of blood tracking in their own states. Answers to questions about the training and handling of tracking dogs. Blood tracking tests to document the competence of your dog. Access to workshops, clinics, tracking literature and merchandise at reduced prices. Networking with other handlers in your area and around the country. Access to the UBT website and Facebook Group (for members only) where you can share your stories and pictures. 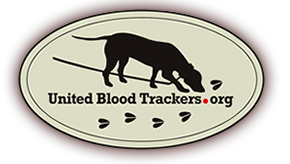 Knowing that by your membership you are helping to further the UBT mission of promoting the use and availability of tracking dogs for the recovery of wounded big game. You have the option of being added to the Trackers map. NOTE: This is not a requirement for joining UBT.